Members of Historical Good, top row, from left: Kayleigh Travins, Margo Boland, Maggie Shoemaker, and Sophia Brady; bottom row: Bridget Brady. Not pictured: Jen Fox, who was away at camp. For a group of teenagers in Southborough, Massachusetts, summer vacation came with a mission: saving a 167-year-old mansion. Known as the Burnett/Garfield House, the Second Empire-style stone structure at 84 Main Street was built c. 1847 as the home of businessman Joseph Burnett and his wife, Josephine. Burnett, an active town leader, created the first liquid vanilla extract commercially produced and sold in the United States. 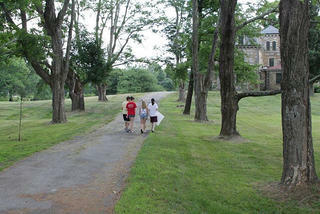 When it was reported earlier this summer that the mansion’s current owner was considering selling it to a developer who would seek demolition, a group led by local teenagers Bridget Brady, 14, and Jen Fox, 15, rallied to save the 2 ½-story structure, which requires sizable repairs. Late last month, in the wake of the group’s protests, the current owner decided not to move forward on the sale. The story isn’t over, though. A full renovation is estimated to cost upwards of $1.5 million. But given the outpouring of local support to save the house, led in large part by this group of teenagers, the future of the house looks significantly brighter. We spoke with Bridget Brady, who’s starting her freshman year of high school this fall, about the history of the Burnett/Garfield House and why she felt compelled to save it. The Burnett/Garfield House was originally the home to Joseph Burnett, who created the first liquid vanilla extract commercially produced and sold in the United States. Can you tell us a little about the history of the Burnett/Garfield House? It was built for Joseph Burnett. He was married to Josephine Burnett (I don’t know her maiden name), and they had many kids. Joseph Burnett started Burnett’s Vanilla Extract [the first liquid vanilla extract produced in the United States]. Also, the Burnett family started Boston Terriers, started Deerfoot Farms, which is big in our town, and ran Deerfoot Dairy and Sausage. This family was active in the town. They started St. Mark’s and Fay schools [prestigious private schools]. … And St. Mark’s Church, which is a church around here, [started] in one of the houses on the property before it moved into the big building in town. The Garfield Family, I don’t know too much about. I know they’re a well-known family and lived here and loved the house. … The Garfields were the last owners to live there. Did you say the Burnett family started Boston Terriers? Yes! I own a Boston Terrier. I feel very connected to the breed. I was reading up on their history, and I stumbled upon this book. In it, [I read] the Boston Terrier was the first dog bred in America. The female dog, Gyp -- the mother that started this entire breed -- lived in the Burnett House and was bred there. I thought that was pretty cool. 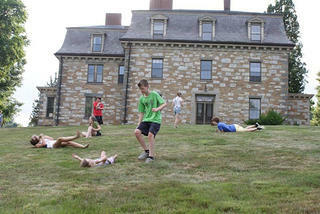 The Burnett/Garfield House is "like the castle of our town," says Bridget Brady, 14. Is that what got you interested in the house? I was always interested in the house. I would drive by it all the time. It’s on the way to my old school, and I played lacrosse, and I always liked to look at it. It’s kind of like the castle of our town. So that was when my first interest in the house started. And I love history, too. Once I got older, I started to develop a bigger interest in old stuff. I love old stuff, and I got really interested in the house that way. And I also started loving architecture, too, a couple years ago. I like to draw houses. And then [learning about] the Boston Terriers added on a whole other layer. After you found out it was possibly going to be demolished, what did you do? What were the first steps you took to save it? I was thinking about all the ways I could try to save it, because it meant a lot to me. And so I [decided] I’m going to protest! I’m going to organize something to try to save this house. After I got home from the dentist, I made posters. My first posters were absolutely terrible. But I wrote to MySouthborough so they might be able to post about it and get out some more information that I am having a protest and for people to come. They also did Instagram direct message, texts, calls -- just anything to try to get people. (From left) Kayleigh Travins, Bridget Brady, and Maggie Shoemaker rallied to save the historic Burnett/Garfield House, built c. 1847. So I guess that was the first initial step to try to grab people. And then once all that was done, I went over to the site. … I started out on the side of the road holding a sign by myself. That took a lot for me. It was an interesting experience. I haven’t done anything like that before, so that was a big learning experience for me. 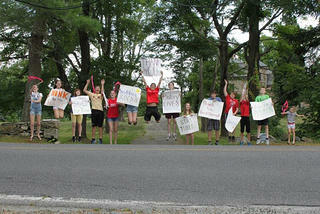 I was standing out there, by myself, then two of my friends came, and two of my friends came later, so we all held up signs that first day. And then Jen Fox, my co-leader, just came back from a meeting about the house that night. We talked about the house, we talked about our interest, and how terrible it was that it was going to be demolished, and we decided to join up and work to save it. From that moment on, we were constantly trying to get people out there. And by the next day, [Jen] was back again. We also had [other friends] Kayleigh Travins, Maggie Shoemaker, Ann Boland, and Margo Boland who came out, too. There were people who came out every single day, 12 hours a day. They were awesome. Then from there we also delegated. Maggie Shoemaker ran the Facebook [page]. I ran the website and the blog. Jen Fox started the petition, which now has over 1,500 signatures. And we also started on Instagram, Facebook, Twitter. We just kept on thinking about new ways to reach people. From there it really took off. People started donating [including posters and fliers]. People were being awesome. They were dropping off food, too. We persisted every day. 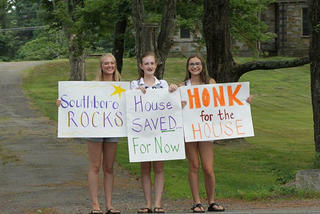 Led by local teenagers Bridget Brady and Jen Fox, a number of young Southborough residents joined the fight to save the Burnett/Garfield House from demolition. Did it take much convincing to get your friends involved? They came out easily. They were like, “Let’s do this thing.” And they asked, “What can I do?” … They were incredible. What ultimately happened to the house? How was the issue resolved? It’s not actually resolved. Well, yes and no. It’s resolved in that it’s not going to be demolished. And that’s the biggest hurdle. That’s what we set out to do. However, we’re also trying to get this house completely preserved. [The owner] seems very willing to work with the town to try to preserve it. So, yes, our biggest hurdle has been overcome, but there’s still a lot of work to be done to see it preserved for good, because that’s what we really do want to see. At that point, we didn’t really know what we did. We knew we did something. We knew we greatly impacted and saved the house, and it was incredible. We started screaming. It was amazing. We had a pool party that night. That was the real moment we knew that we could do something. We just did do something. And this worked, and all of this paid off. 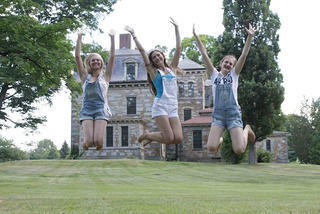 (From left) Kayleigh Travins, Maggie Shoemaker, and Bridget Brady celebrate on the grounds of the historic Burnett/Garfield House. How does it feel to know you helped to save such an important piece of your town’s history? I can’t even describe it. Amazing, incredible. I feel strong, and so happy, to see it saved. It’s an amazing feeling to know that I could do something, and that I could save something that I really believed in. But let me say that it wasn’t just me -- it was the team, our whole team of friends, and all of Southborough, really, and all the supporters. There were many people working behind the scenes, as well, that we really didn’t know about [while we were] standing out there 12 hours a day. But we knew there were people doing work -- people asking if it could get on the historical record, or people doing whatever they could. So it was a town effort. It’s just an amazing feeling that we all could come together and stand up for what we believe in. It’s such a great feeling to see such a beautiful, beautiful building saved. To learn more about the Burnett/Garfield House, and to read the group’s blog detailing their fight to save the house, visit www.historicalgood.org.